Started on March 26, 2016, Nick and Judy can be seen in the Move it! Shake it! Dance & Play it! Street Party parade at the Magic Kingdom here at Walt Disney World. Nick and Judy is also currently meet-able at Disney California Adventure. However, there are no regular meet & greet for Nick Wilde and Judy Hopps here at Walt Disney World anywhere yet! I love "Zootopia" and Nick Wilde and Judy Hopps are my favorite characters from the movie. Many people should like it. 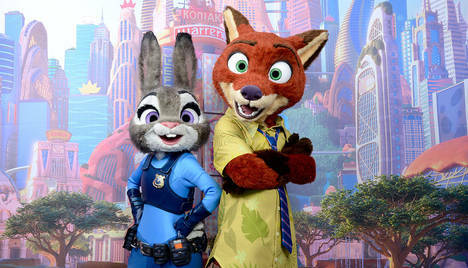 Since the movie is popular, I declare that they should have a regular character meet-&-greet spot anywhere at Walt Disney World with Nick Wilde and Judy Hopps? Since they seem to look great and it should be well fitted to it. And it should deserve hugs at the every or many Disney Resorts. And through The Animal Kingdom seems it did not added any recent characters in the past few years, It seems to be a good place to add those characters here. If not, maybe add a character dining to any dining area at Animal Kingdom Lodge especially Boma. I'm really hoping those characters should be added to the regular meet & greet by either later in 2016 or around 2017. So let's sign, support, and tell Disney to add an meet & greet Nick Wilde and Judy Hopps to anyplace at Walt Disney World.